Pedalling while you work at a bike desk is perfect for home or office. 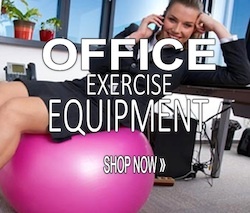 A perfect way to fit in some cardio while sending emails or maybe just watching your favourite Video channel. If you find the bike is rocking while you pedal the legs have individual adjusting ability to keep it level. This is for any slight unevenness there may be in the floor. Fortunately this bike is fairly quiet. The noise level is not so much that you cannot watch a movie or talk on the phone. Because of this it is becoming a welcome addition to the office environment. The pedals themselves are non-slip material and have adjustable straps to help keep the feet in place. The general feedback on the seat that comes with the Stamina Recumbent Cycling Workstation is that it is pretty good for most. The backrest is helpful for people who like it. Classified as a stationary bike it can operate as a intense cardio machine if that is what is desired by the owner. The handles to the side of the seat allow for added support. The seat adjusts as well as heights and distance of the desk from the rider. This allows for different size persons as well as accommodating people who want to stand while they work too. The recommend height spread is pretty good and suggests it can accommodate persons who are 4’11” up to 6’4”. People with really long legs might not find it too comfortable. 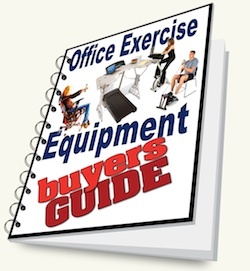 If that is your case you might need to look at a different design of desk cycle. The seat height is adjustable by loosening a knob, removing the pin, and raising or lowering the height to where it is comfortable for you. Once that is in place just reset the pin and tighten the knob. This will keep the seat securely in the position you find most comfortable. 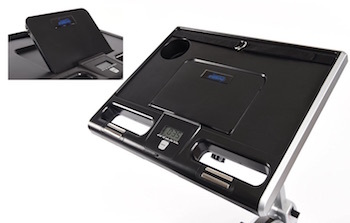 The desk on the Stamina Recumbent Cycling Workstation is also multi-adjustable. Both the height and angle of the desk can be leveled for comfort. An additional option is to set the desk further away from the seat altogether where it can double as a standing desk. Adjusting the angle and height works in a similar fashion as the seat with the pins and knobs. The angle can be adjusted in 5 degree increments from 5 – 20 degrees for working needs. 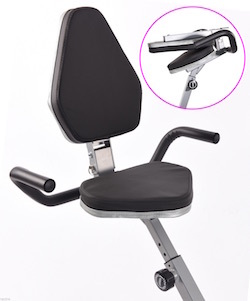 The minor adjustments allows the user to sit more upright if they choose to work that way. Others prefer to lean more forward. Standing at the desk when you take a break from pedalling is a nice feature. Just push the desk away using the adjustment knobs and hop off the seat. There is enough room so feet don’t get caught up in the pedals while working and standing provided the pedals are left in a perpendicular position. The height of the desk itself can also be raised or lowered from 40” – 441/2”. Not a lot of span but acceptable for most people. As with all things dust and crud will develop. Do you eat at your desk? Regardless of whether you are dropping dog fur or just regular everyday dust, the desk bike should be cleaned just like any office furniture. Simply wipe off the machine with a damp cloth. If you do use it for more extreme exercise then wiping up the sweat every time will keep it in good shape. Some folks prefer to just have a light setting while they work. Others like to really crank it up for a good cardio workout. Either way the level of resistance is set by using the tension knob on the front fork of the bike. Keep in mind this is not one of those industrial machines like you would pay thousands of dollars for in the gym so the tension is only available in a light to moderate setting. This model does fold for simple storage. If you don’t want to leave it set up just tuck it away behind the filing cabinet. To enable the machine to fold just pull the pin on the seat frame and squeeze the support frame together. The pin is reinserted so the workstation will stay in a folded position. Moving into a storage area is easy because the bike doesn’t have to be lifted. There are wheels on the back of the bike leg that you tip the bike on and roll away. These also dome in handy to move the bike around into place when set up too. Fortunately there isn’t much assembly required as it comes partly assembled in the box. Just follow the instructions that come with it and you should be up and pedalling within a half hour. The tools required are included. 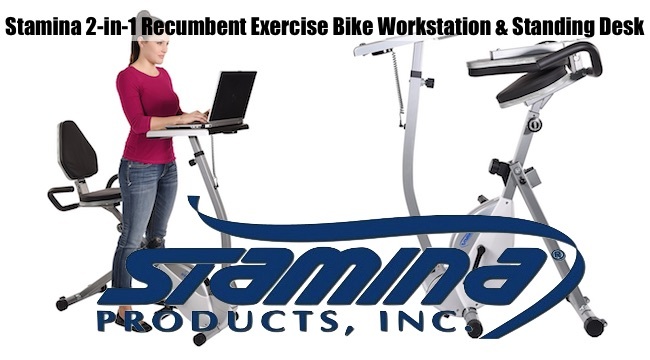 The assembly manual for the Stamina Cycling Workstation shows all the parts and how to put them together. A second pair of hands would be helpful but not required. Doing it yourself can be a little awkward because of the uneven distribution of the weight in the frame. On the desk and close to the user is still visible until the desk is pulled closer. The display is easy to read so long as there is additional light in the room. It isn’t an LED console like the larger models so you will need light to see the numbers. 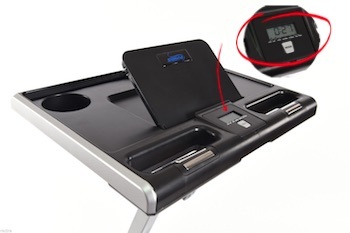 The display will measure the time lapsed as well as show the distance, speed, and will calculate the calories burned. It isn’t a truly accurate indicator but pretty good for most applications. The numbers can be reset between uses. The numbers will display automatically as soon as you begin to pedal. It can also be started with the mode button. This button will also scroll through the displays and can be set to revolve automatically. The display is not made to attach to another calculating machine nor is there an app to upload the statistics. There are no pre-set exercise programs like you find with the commercial machines either but then again, that isn’t what this particular fitness product was designed for. Above we discussed the desktop and it’s various positions. Additional accessories include the water bottle holder and tablet holder. The tablet holder also accommodates books. The desk surface is a little narrow at only 171/4” X 10”. Most laptops are 17” or under but the no room for a side mouse. There is a handy strap to keep it from being knocked to the floor by the pedalling vibration or by accident. Another drawback is the drink holder isn’t easily accessible when the desk is being used.